Soft fruits are in season again and thoughts are turning ineluctably to Pavlova. You’ve probably made a good few in your time (especially you Antipodean readers). Ah, but how about a rolled up Pavlova? Ages ago I got a fabulous-sounding recipe from friend and supercook (make that Masterchef) Liz Franklin. The ingredients were as for the classic Pavlova meringue (egg whites + sugar + cornflour/cornstarch + vinegar) – so far so unsurprising. 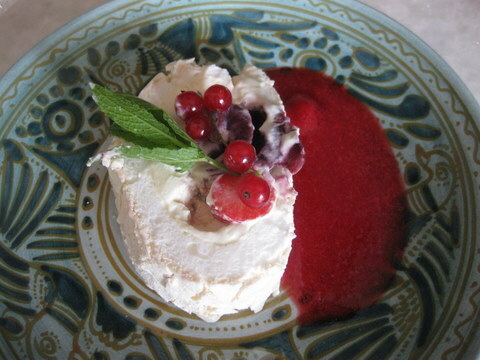 Then Liz instructed that the Pavlova be spread out in a rectangle on baking parchment, baked, turned out, filled with whipped cream and fruit and rolled up, roulade-style. Rolled up? A meringue? It would never – could never – work, I muttered, disbelievingly. But it sounded irresistible, and of course Liz knows her onions (and meringues, and more). I had to try it. Egg whites were beaten to a frenzy with a pinch of salt, followed by sugar and cornflour and the tiniest schuss of Melfor (Alsace’s answer to vinegar, honey- and herb-infused). I laid a sheet of baking parchment on a baking sheet, plonked the meringue mixture in the middle, spread it out to the edges with a spatula and baked it, as directed, for just about half an hour (at 140C). I set it on a rack, still on its parchment, to cool a little. Then I sugared a second sheet of non-stick paper and inverted the meringue onto it. The first surprise was that the parchment used to bake the Pavlova peeled away like a dream, exposing a gorgeous marshmallowy meringue underside. I whipped the cream, slathered it over most of the surface, covered the cream with soft fruit (the first rasps, redcurrants and wild strawberries from the garden plus black cherries and apricot pieces). Then, panting a little, I used the second sheet of sugary paper to help roll it all up in a neat bolster. 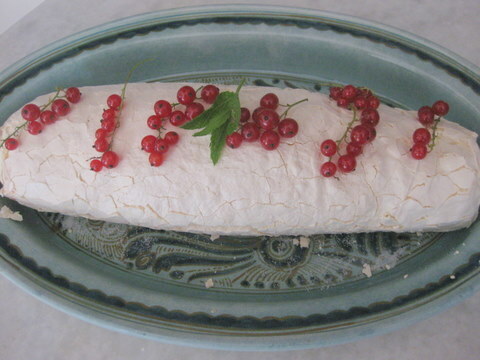 Eh voilà: Liz’s Pavlova Roulade (and a bow to Liz!). Give it a go, it really works. Tastes wicked too. Previous: Previous post: Does burying the stones/pits in your guacamole stop it going brown? Yum a rolled up Pavlova! Looks beautiful! goferit Jill – and let me know how it worked out! hi dear anita – it’s beautiful to behold and v. delicious, you have to try it with Winch soft fruits! Made it last night for a family ‘do’ and it just cracked when it began to roll!! So disappointed but my family just reminded me that there is never a ‘bad’ pav……..just piled it together, smothered in strawberries and it was devoured! However, want to make it again and have it rolled nicely. Can anyone offer suggestions? Thanks…..actually recipe I followed had me cooking it at 120 degrees for just over an hour, so maybe it was overcooked therefore it dried out and just ‘cracked up’. Definitely will try it again and only cook it for 30 minutes. Thanks again for your advice! no worries, best of luck with the next one!